Two Can Play Multi-Use Pillow Set is rated 4.6 out of 5 by 11. 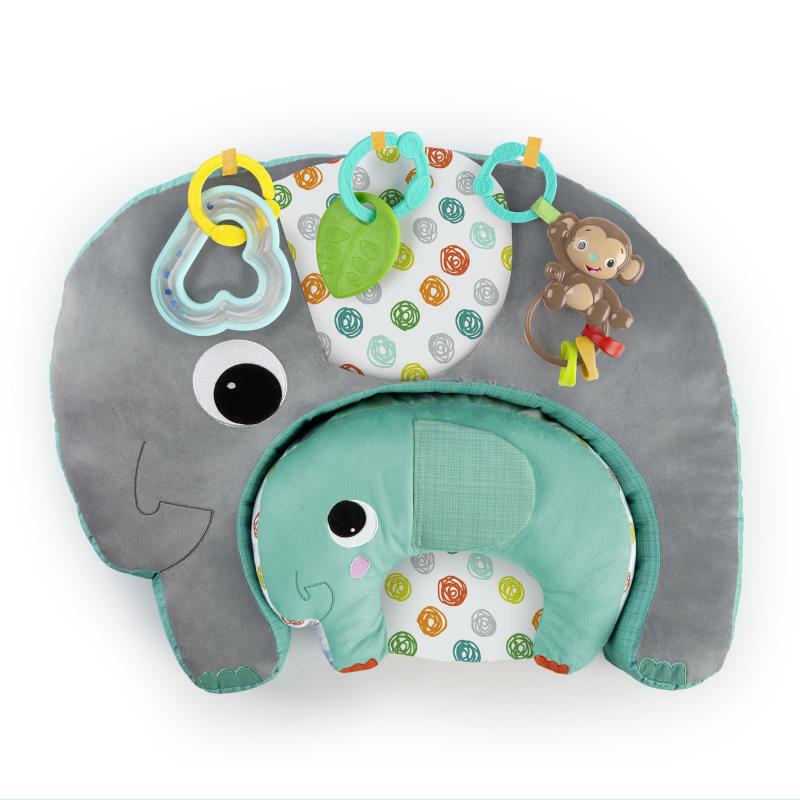 Elephant-sized comfort for nursing, tummy time & co-play! Dimension (in) 23" x 40" x 6"
Rated 5 out of 5 by momandteacher from So cute and practical! I loved that this pillow set had multiple purposes. It could be used for feeding, propping, and playing. The elephants are cute and I love that there are some toys attached and included. The toys were perfect for my daughter and were engaging, without being too overwhelming for my 4 month old. Rated 5 out of 5 by ShelleyB from Never seen anything like it, but it's so cool! I have never seen anything like the Bright Starts Two Can Play Multi-Use Pillow Set but it's so cool! Your little one will literally grow up playing with this. From lounging, to tummy time, to sit and play. My kiddo was so focused on the toys that tummy time wasn't a "chore". He didn't mind it where before unless you're really engaging him, he minds and lets you know it. We tried a little sitting with it too. It's just so very cool how versatile it is! Definitely something I will be getting for new moms to be able to use from the beginning! Rated 5 out of 5 by GillianMB84 from Great for Babies Who Hate Tummy Time! I was so excited to try out the Bright Starts Multi-Use Pillow Set! In the past, I bought a tummy time pillow, baby lounger and nursing pillow...so I was excited to see all three options in one pillow. My LO hated tummy Time, so my favourite function was the two can play tummy time option. I could comfortably get to his level and encourage tummy time activities. While I didn't use the lounge much, my older child loves sitting on the pillow to read and relax. I like that the fabrics are quality and the design is gender neutral. Very happy with this product! Rated 3 out of 5 by MrsLanier from Cute concept My little one really likes his elephant pillow! We can do tummy time together and he’s laying right in front of me. You can move the toys that it comes with around and have them in multiple places for your child to play. I do find the pillow for the child to be a little on the small side and my son slides off of it. Also it’s a very cool concept but I find it to be almost impractical and not something we can play with often because it’s hard for me to set it up and then get down on the floor and then lay on the floor with him, just not something I would do too often. My son also likes the pillows but gets bored after a while. Rated 5 out of 5 by Tink from Fabulous Design Idea Having a the two pillows is a GREAT idea. I have used other "boppy pillows" prior to this one and I would chose this one over all that I have used before. Being able to use this for belly time as well as nursing was a HUGE plus! We LOVE IT!!!!! Rated 3 out of 5 by MrsLanier from Cute concept My little one really likes his elephant pillow! We can do tummy time together and he's laying right in front of me. You can move the toys that it comes with around and have them in multiple places for your child to play. I do find the pillow for the child to be a little on the small side and my son slides off of it. Also it's a very cool concept but I find it to be almost impractical and not something we can play with often because it's hard for me to set it up and then get down on the floor and then lay on the floor with him, just not something I would do too often. My son also likes the pillows but gets bored after a while.